EVERETT — The Pacifica Chamber Orchestra ends its sixth season with a Sunday matinee featuring a program of mid-century modern compositions. The orchestra’s “Summer Concert” begins at 3 p.m. June 5 at First Presbyterian Church, 2936 Rockefeller Ave., Everett. Fred Chu leads a program that includes Ernest Bloch’s Concertino for Flute, Viola and Strings. 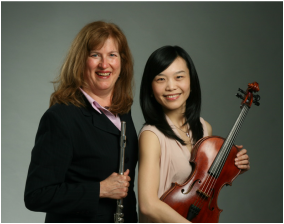 Pacifica members Lynn Douglas-Nicolet on flute and Agnes Chen on viola are the soloists. The piece was written in 1950 when the Swiss-born Bloch was lecturing at the University of California at Berkeley and living in Oregon. “It is one of the composer’s most romantic and joyful pieces ever written,” Chu said. In the 1960s, the Russian composer Rodion Shchedrin re-worked Bizet’s opera “Carmen” for strings and five percussionists. The music was composed for a new Bolshoi ballet titled “Carmen Suite.” In the Soviet Union it was initially deemed too modernist, sexual and insulting to Bizet. Joining the Pacifica strings for the Shchedrin piece are percussionists Ian Alvarez, Curt Cheever, Ryan Fox, Ryan Templin and Taryn Zickefoose. Chu is playing his violin, so the work will be performed without a conductor. Also on the program is French composer Jacques Ibert’s well-known “Divertissement” for Chamber Orchestra. The nonprofit Pacifica Chamber Orchestra performs five subscription concerts each season with help from the Everett Cultural Arts Commission.